Why are trail conditions important? Hiking or biking on soft-surface trails when they’re muddy can severely damage the surface. The trails through Town are designed with drainage in mind, but during the snow / rainy season things may not drain properly. When there’s snow on the ground, and temperatures rise above freezing, the ground begins to thaw the top layers of soil. However, the ground below is still frozen. This doesn’t allow for proper drainage and can cause a moist and muddy surface. Walking, riding or hiking when it’s muddy can damage trails, requiring costly and time-consuming repairs. 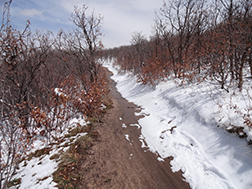 A good rule of thumb – if you see snow on the ground, stay off the soft-surface trail. The Town has more than 30 miles of concrete trails that are available year-round. Help us keep trail users up to date on current conditions by posting your findings here! Hidden mesa from trail head to trail head (Pleasant View down to the Rt 83 side and back) including the rim loop is in usable condition. There was a small patch of snow/ice on the south edge of the rim, but no more than 10-15 feet of it. Otherwise the trail is dry and firm, with what little snow hasn't completely evaporated having receded far back in to the surrounding fields.? The Rock Hawk Trail races will be held this Saturday from 7-11 am and therefore these two trails will be closed to ALL BIKE RIDERS during that time.